Maria Palozola is a nationally known Golf Professional and owner of St. Louis Golf Lessons and the Lead Instructor for the Golf Channel Academy with Maria Palozola in St. Louis, MO. 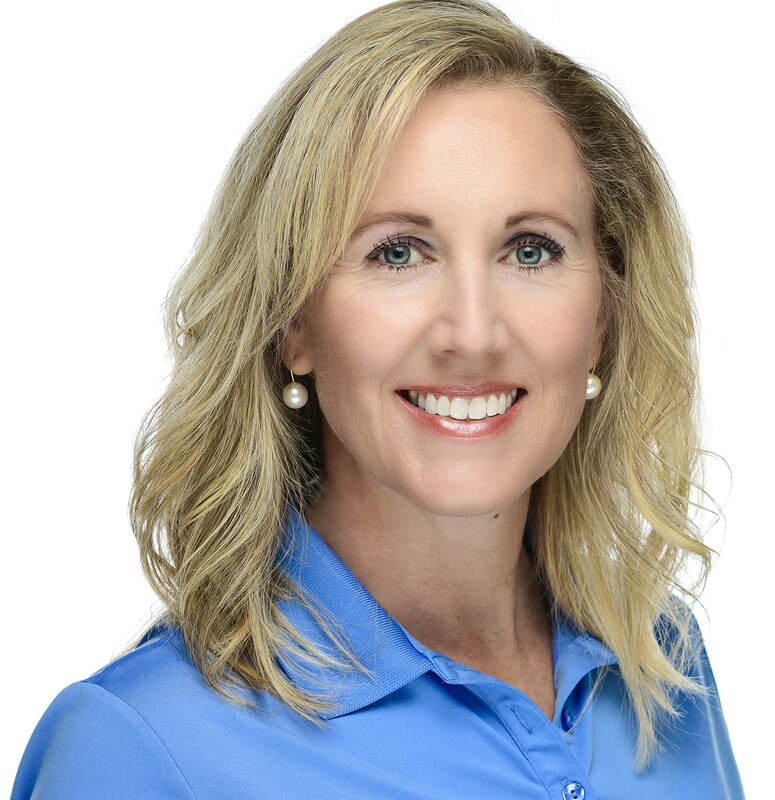 Since 1994 Maria has dedicated many hours to grow the game initiatives working with handicapped golfers, juniors, women golfers, beginners and the like to make golf more accessible. She decided to take action on her long time dream of developing a foundation that could use golf to help others in May of 2018. Having a Father who fought in WW2 in the Battle of the Bulge and Grandfather that fought in WW1 (both who loved to golf) and a nephew that fought in both Iraq and Afghanistan. Maria had planned to work with her nephew (who dedicated his life to helping his fellow veterans), before he passed to use the game of Golf to better the lives of veterans and their families. She resides in St. Louis with her 2 sons. Sally Cherre is Co-Owner and Practice Manager of Cherre Orthodontics. Sally has a long history of volunteering and fundraising, including being on the founding committee for the first Manchester Homecoming Weekend and being its Marketing chair for ten years. She was Cashbah Auction Chair, Card Party Chair, Mothers Club President and Alumni Mothers Club President at St. Louis University High School. She served as a Board Member of the LaSalle Retreat Center, creating a successful "Buy a Bed" campaign. As a member of St. Joseph Parish, Sally has chaired some major events including a kick-off event for its Foundations for the Future capital campaign and several dinner auctions. She also served on their ACTS Core Team and has served on 30 ACTS retreat teams throughout the St. Louis area, and in Illinois and Toledo, Ohio. Along with Maria, Sally is passionate about honoring her father, grandfather, and nephews by helping their fellow veterans through Forces on the Fairways. ​Bill Bounds is the owner of Bounds and Associates, LLC. Bill became a CPA in 1975 and joined Lester Witte & Company CPA’s, a national accounting firm where he became the youngest managing partner of any office in the firm. In 1981, Bill and his St. Louis partners formed Bounds, Poger & O’Donnell CPA’s, later merging his personal practice into Humes, Barrington, P.C., both large local CPA firms. In 1998 Bill formed his solo practice which continues today. Bill has served as the CPA for several non-profit organizations in addition to serving as board member on several non-profit organizations. After being widowed in 2004, Bill married Kathy Simpson Patterson (also a widow) in 2014, a friend since junior high school. Together they have six children and eighteen grandchildren. Jim Gissy founded Capital Management Services, Inc., as an independent Registered Investment Advisor in 1986 after beginning his career with Drexel Burnham Lambert and later Shearson Lehman Bros.. CMS today is now used by many advisors around the country for it’s unique investment strategies. Jim is a life-long St. Louisan and graduate of St. John Vianney HS and St. Louis University. Jim is very active in his church and community and has coached hockey and baseball. Jim's leadership skills are well recognized as he has been asked to direct a Parish ACTS retreat and 3 Mission ACTS retreats in addition to other leadership roles in 16 ACTS retreats. In addition he also directed one other Christian retreat. Jim as been Parish Core Team President, a Board member of St. Louis Amateur Blues Hockey organization, and is currently serving as a Board member of St. Louis ACTS Missions. Jim is a St. Louis facilitator for Speaking Circles, an organization that helps individuals with public speaking. He considers his top accomplishment as raising 5 amazing children and marrying his wife Karen. ​Retired Brigadier General David Irwin served more than 31 years in the United States Army and National Guard. He began his military career as a Field Artillery Officer at Ft. Sill, OK. After leaving active duty, he joined the Missouri National Guard where he held command positions in the 128th and 129th Field Artillery Battalions. He commanded the 70th Troop Command in St. Louis before being promoted to Brigadier General and command of the 35th Engineer Brigade. General Irwin is Chair of the Salute to the Troops, an annual event during Fair St. Louis to thank troops and families for their service. He is on the Board of Directors for Care Packages for the Troops Foundation doing business as Operation Sunscreen, an organization founded by his wife, Karen, which sends care packages to deployed service members each year. He retired from service as Deputy Commanding General for the 35th Infantry Division in 2013, and is currently an International Training Program Manager with The Boeing Company. David and his wife Karen live in Ballwin, MO and have two sons, David and Stephen. Foundation and Forces on the Fairways. Patrick Lepski is Civil Engineer from the Missouri University of Science & Technology and has extensive experience in leadership and management. He has served as National Sales Manager for Schneider Electric, a Fortune Global 500 company. He is presently Assistant Director of Investment Relations for Visionary Private Equity Group which is headquartered in Saint Charles, Missouri. Pat also serves on Board of Directors for FAST (Foster Adoption Support Team) which brings food and services to families with foster and adopted children as well as for TREE House of Greater Saint Louis, an organization that is a leader in the field of equine-assisted therapy (horse-back riding) for children and adults with special needs to help them develop core strength to lead a more fulfilling life. Pat is also involved with Boy Scouts of America and is currently working to improve the Scouting for Food program that is done nationwide every Thanksgiving to support food pantries. Pat currently resides in Saint Peters, Missouri with his wife Christine and son Daniel. ​Matthew Matava, M.D. is currently a Professor of Orthopedic Surgery and Physical Therapy at Washington University in St. Louis where he is also Chief of the Sports Medicine Service. He completed his internship and orthopedic surgery residency at Emory University in Atlanta, Georgia, followed by a fellowship in sports medicine and arthroscopic surgery at the Cincinnati Sports Medicine and Orthopedic Center. He was the Head Team Physician for the St. Louis Rams for 16 years and was president of the National Football League Physicians Society (NFLPS) from 2013-2015. Dr. Matava has also been a team physician for the NHL's St. Louis Blues for the past 20 years, and he is the Head Team Physician for the Washington University Varsity Athletic Program. Dr. Matava has authored over 130 publications dealing with orthopedic sports medicine topics. He has been listed as a “Best Doctor in America” since 2005. Captain James A. Muir, P.E. Captain James A. Muir, P.E. served 27 years in the United States Navy as an officer in the Civil Engineer Corps. His early career was spent with Naval Reserve Construction Force (SEABEES) units. In 2003, then CDR Muir was called to active duty to serve as the Operations Officer for the Navy’s Anti-Terrorism and Force Protections Ashore Program. He deployed to Afghanistan in 2006 as a member of the Combined Security Transition Command – Afghanistan’s Detainee Operations Directorate. During that tour he was wounded by a suicide bomber near the detention facility in Pol-e-Charkhi. He completed his deployment in April of 2007 and returned to reserve status. He was recalled again in 2009 to serve as the Head of Emergency Management at the Navy Bureau of Medicine and Surgery (BUMED) in Washington, DC. In 2010 he was assigned to the Afghanistan – Pakistan Hands Program and deployed for 12 months to Kabul to serve as the in-theater Program Manager. Upon return he was assigned as a Division Chief on the Joint Staff Pakistan – Afghanistan Coordination Cell. Jim retired at the rank of Captain in 2014. CAPT Muir is Seabee Combat Warfare qualified, and authorized to wear the Joint Staff Identification Badge. His numerous decorations include the Defense Superior Service Medal, Bronze Star Medal, Purple Heart, Defense Meritorious Service Medal, Meritorious Service Medal, Navy Commendation Medal (2 awards), Navy Achievement Medal, Joint Meritorious Unit Award (2 awards), Afghanistan Campaign Medal (4 campaign stars), and Combat Action Ribbon. Jim currently works as a lab manager for Boeing Research & Technology. He is a registered Professional Engineer in the state of Missouri and holds 4 patents. He has a Bachelor’s Degree in Electrical Engineering from the University of Missouri – Rolla and a Master’s in Business Administration from Maryville University. Jim is a lifelong resident of St Louis (except during his active duty recalls). He is married (Pat) with three daughters (Jenny, Jessie & Jamie) and three grandchildren (Reagan, Madeline & Henry). He’s an active member of the Knights of Columbus, and serves on the Parish Council for St Joseph’s Catholic Church in Manchester, MO. Ryan Young is a veteran of the United States Army, where he served for 6 years including a term in Southwest Asia. As part of his service he received the Southwest Asia Ribbon. Ryan is currently the owner of Kinisi Fitness and Golf Performance, a local gym located in the Chesterfield Valley. As a NASM certified head coach Ryan has multiple health & fitness certificates including TPI Level 3 (Titleist Performance Institute), Precision Nutrition, Crossfit Level 1, OPEX Assessment and Program Design, VIPR, and TRX. Ryan also serves as a Board Member on the William S. Kallaos Family Foundation where he has had the opportunity to help local youth with a focus on foster kids, children with special needs, and under resourced youth. Ryan currently lives in Chesterfield with his wife and three kids and enjoys riding his Harley and perfecting his golf game. Bill Schierman - Retired Sales & Marketing Executive with Anheuser-Busch Inc.